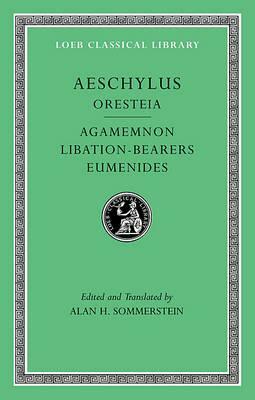 Aeschylus (ca. 525-456 BCE), the dramatist who made Athenian tragedy one of the world's great art forms, witnessed the establishment of democracy at Athens and fought against the Persians at Marathon. He won the tragic prize at the City Dionysia thirteen times between ca. 499 and 458, and in his later years was probably victorious almost every time he put on a production, though Sophocles beat him at least once.Of his total of about eighty plays, seven survive complete. The first volume of this new "Loeb Classical Library" edition offers fresh texts and translations by Alan H. Sommerstein of Persians, the only surviving Greek historical drama; "Seven against Thebes", from a trilogy on the conflict between Oedipus' sons; Suppliants, on the successful appeal by the daughters of Danaus to the king and people of Argos for protection against a forced marriage; and Prometheus Bound (of disputed authenticity), on the terrible punishment of Prometheus for giving fire to humans in defiance of Zeus.The second volume contains the complete "Oresteia" trilogy, comprising "Agamemnon", "Libation-Bearers", and "Eumenides", presenting the murder of Agamemnon by his wife, the revenge taken by their son Orestes, the pursuit of Orestes by his mother's avenging Furies, his trial and acquittal at Athens, Athena's pacification of the Furies, and the blessings they both invoke upon the Athenian people. The third volume of this edition collects all the major fragments of lost Aeschylean plays.